Michigan OKs Nestlé Water Extraction, Despite 80K+ Public Comments Against It : The Two-Way Many public comments cited a clash between corporate greed and the welfare of people and the environment. Nestlé is seeking to pump 576,000 gallons of water each day from a well in western Michigan. Bottled water is packaged for shipment at the Nestlé Water bottling plant in Stanwood, Mich. 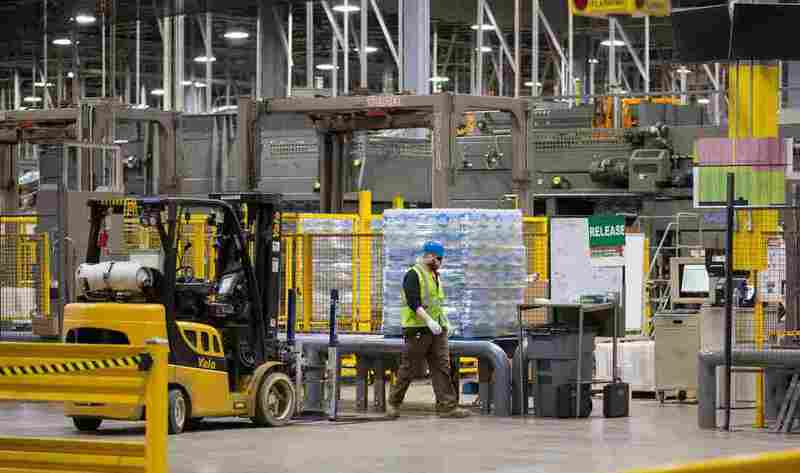 In a much-watched case, a Michigan agency has approved Nestlé's plan to boost the amount of water it takes from the state. The request attracted a record number of public comments — with 80,945 against and 75 in favor. Nestlé's request to the Michigan Department of Environmental Quality to pump 576,000 gallons of water each day from the White Pine Springs well in the Great Lakes Basin was "highly controversial," member station Michigan Radio reports. But despite deep public opposition, the agency concluded that the company's plan met with legal standards. "It is very clear this permit decision is of great interest to not only residents in the surrounding counties, but to Michiganders across the state as well," MDEQ Director C. Heidi Grether said in approving the permit. "In full transparency, the majority of the public comments were in opposition of the permit," Grether added, "but most of them related to issues of public policy which are not, and should not be, part of an administrative permit decision." "The state says Nestlé has to complete a monitoring plan and submit it to the DEQ for approval," MR reports of the 58-page final memo from the Michigan agency. With that recent history as a backdrop, Nestlé's plan to boost the amount of water it takes from the Great Lakes State drew attention and added another dimension to a debate over whether water should be seen as a commodity, a commercial product — or a human right. Nestlé's well is in western Michigan, near the town of Evart, as Michigan Radio's Lindsey Smith reported on The Environment Report podcast. The company bottles the water for sale under its Ice Mountain label. To get through the massive and unprecedented public response for comment, Smith said, the state's environmental quality department created categories of responses, after reading several thousand of them. The resulting themes dealt with a range of ideas, from the potential environmental damage of the water plan to calls for a public vote on the increase. "The interesting thing to me," Smith said, "was the top three themes — by far — are: [one,] corporate greed versus people and the environment; two, water is not for profit; and three, worries about privatizing water." Smith added, "about 40,000 people wrote about each of those concerns." Even with those comments taken into consideration, the Michigan agency was still bound to make its final determination on the legal merits of Nestlé's request. "And that's the end of it," the agency's source water supervisor, Matt Gamble, told Smith last month. "We don't have the power to say no arbitrarily. We can't just say no for reasons that aren't attached to the law." The agency can't say no, Smith added, "even if the vast majority of the public wants them to."